Travels to Peru. 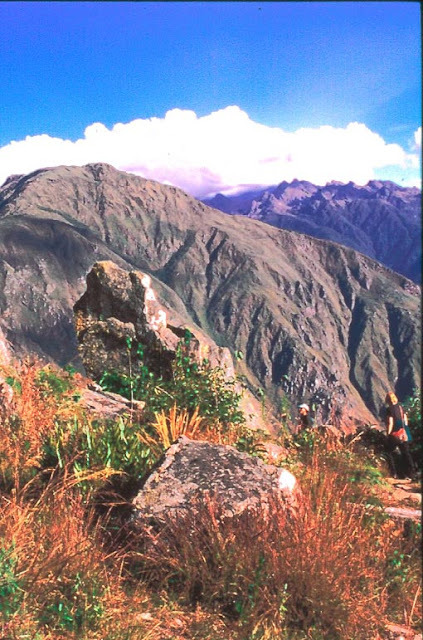 Andean Archaeotourism Programs. zkontiti@hotmail.com - (00511)989 337 715 - Lima, Peru. Understanding is a profound form of knowing. 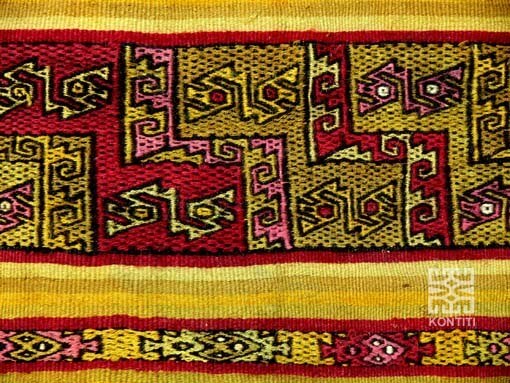 The Andean culture offers us a fascinating conceptual and creative universe in its ancestral art and design. 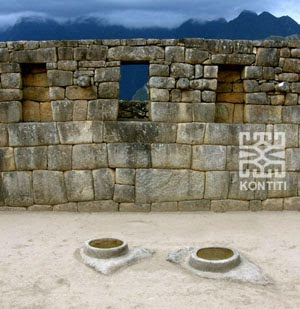 A new vision of the millenary Andean Culture, History and Arts. 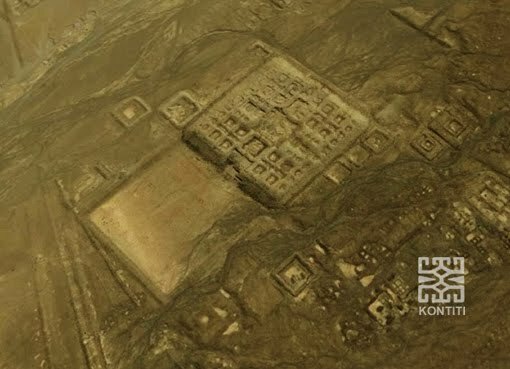 Huaca means symbolic sacred megalithic place or stone. The Sacred Valley Sanctuaries pay homage to the Sun, the ancient grand father symbolized in the Condor, the Earth in the Alpaca, the Water in the Serpent and the Thunder in the Jaguar. The architectural forms occult these totemic animals, whose images are drawn by the cyclical and calendar sun lights. 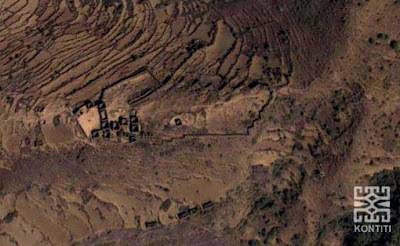 During the last years, Zadir Milla Euribe has researched and discovered the ancient codes of the pre-Columbian symbols and huacas, present in the design of astronomical calendars since the beginning of Chavin culture, four thousand years ago, until the inkas. Only in Machu Picchu he registered 60 unknown light and shadow huacas. 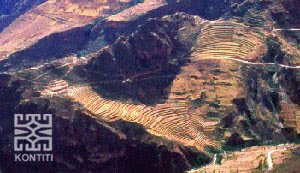 The Big Condor flying constructed with Andean terraces on the mountain, discovered in our exploration travels at Sacred Valley. 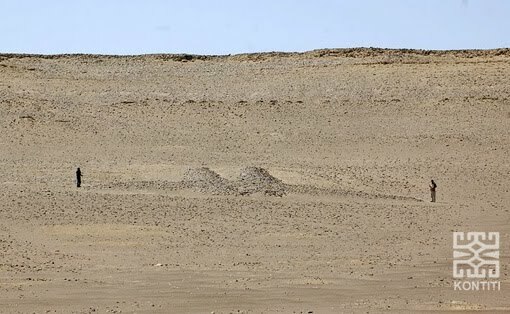 Huaca of the Big Condor of Tampu. 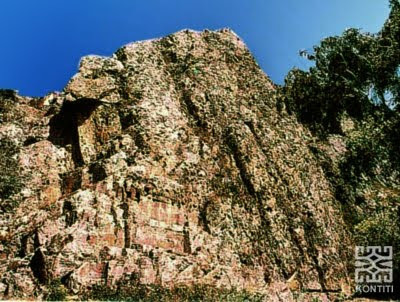 Big Condor temple hidden on the landscape with its secret huacas. View from the top of Wayna Picchu Sacred Mountain, where many huacas are expecting to be discovered. 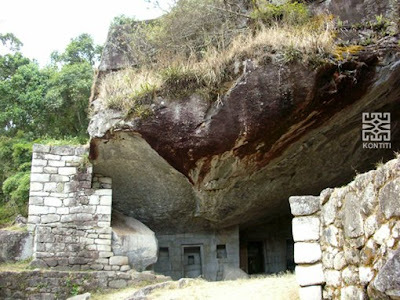 The Sacred Cave keeps some fantastic megalithic huacas. 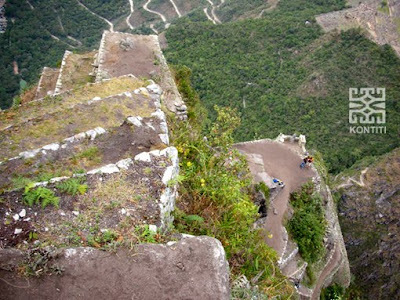 Can you see the Condor shaped temple? Visit it with us. 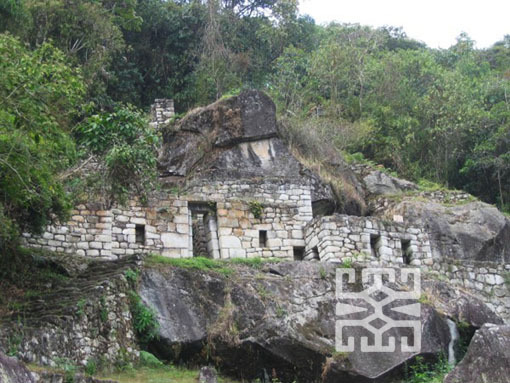 Archaeotourism travels, explorations, consultancies, seminaries and unknown places to discover. Ask for our personalized programs. …To understand masterpieces of the peoples it is necessary to know their cultures, and we build intercultural bridges and open doors beyond the travels we share… Zadir Milla, Kontiti Travels Director. 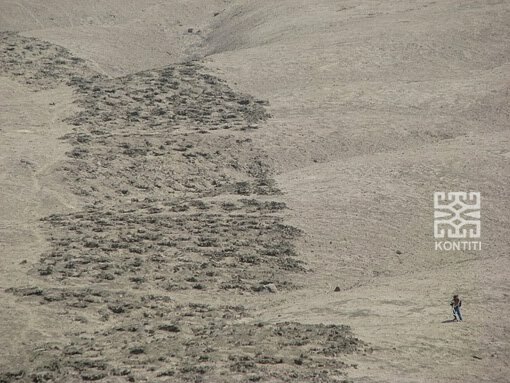 Zadir Milla E. is an artist, designer and researcher of pre-Columbian Andean cosmovision, symbols and sanctuaries codes, pioneer in Andean semiotic. 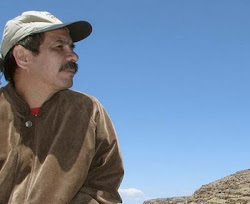 He has published "Introduction to Semiotic of pre-Columbian Andean Design" (1990), the digital books "The Code of Wiraqocha, Millenary Andean Symbolism” (2001) and "Powers and Sanctuaries of the Millenary Andean Cult" (2002), and "The Secret Code of Machu Picchu" (2011). 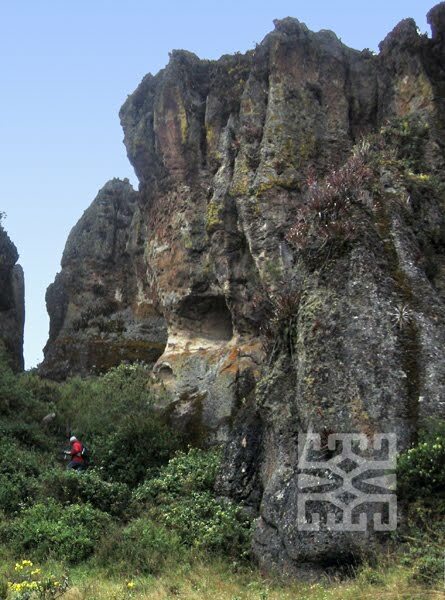 He has walked and explored the ancient sanctuaries with semiotical eyes, opening the mysteries of the sculptoric forms of the megalithic huacas designed with the architecture, landscape and stars. Some of our exclusive places to discover. Paracas geoglyphe of a mythical bird. Temple of the Chakana in the desert. 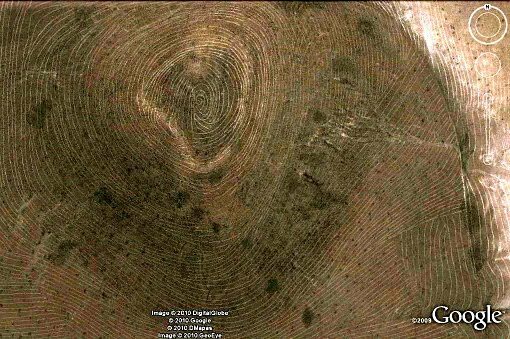 The big fingerprint (20 miles)... Would you like to overfly it? The great guardian from Cumbemayo. 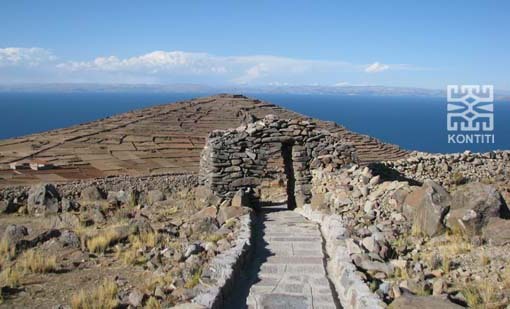 The Pachatata Temple in Amantani Island at Titiqaqa Lake. You can know with us what the Pre-Columbian symbols mean. Bestway Reps. IATA tourist agency. Perú Inédito S.A.C. Kontiti Travels. Perú. All rights reserved. Tema Filigrana. Con la tecnología de Blogger.